Over Christmas I saw a tutorial as a guest post on a couponing blog that I follow. I have been putting off trying these out even though I thought they were super cute. So, since I am making an effort to actually do all of these things that have been on my to-do list, I thought this would be a fun one to do. This project requires very few materials and was relatively easy to make. 4 – 4.5 inch ceramic tiles. You can get these at your local home store, at my local Home Depot I found them in a section for back splashes and floor tiles. 1 – sheet of scrapbook paper. These mostly come in 12×12 sheets, so one full sheet will yield nine squares, enough for two sets of coaster if you buy enough tiles. 1 – small foam brush. I tried to find these at my local Michael’s but wasn’t having much luck finding them individually, but I was able to get on at Home Depot. 1 – ruler. I ended up using this to flatten the sheets as well, so a rigid ruler is probably best. Mod Podge. This is a water based sealer, glue and finished that can be used in a lot of different types of projects. It was a bit of an initial investment, but a little bit seems to go a long way. Flip the scrapbook paper over and measure out 3 and 3/4 inch squares out with the ruler. I am terrible at drawing a straight line with a ruler (maybe that is something I can learn this year), so I made has marks at 3 and 3/4, 7 and 1/2 and 11 and 1/4 inches in three different spots along the paper. Then you can line up the ruler along the three points and get a nice straight line. Repeat this along the opposite side and you will have a perfect grid and you can cut right along the line. Cut along the grid and set aside four of the squares for the first set. 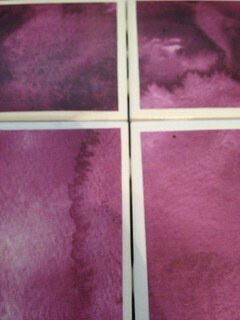 Apply the Mod Podge to the back of one square in a thin layer. Apply the square to the tile, leaving an even border around the square. If you don’t get it perfect the first time don’t panic, there is a little bit of leeway for centering the paper onto the tile, but you need to work quickly. 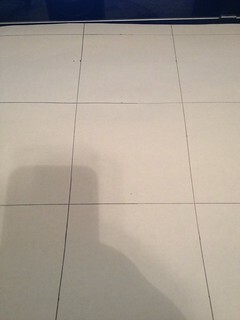 When you are laying it on the tile try to do it evenly, to minimize air bubbles. Once you have it in place you will still have a few air bubbles so flatten the paper out and make sure all the air bubbles are out. I found it much less messy to use the ruler edge to straighten it out. Let the paper dry completely. Completely. The first attempt I got impatient and tried to do the next steps too quickly. This shifted the paper too much and I got brand new air bubbles. So learn from my mistake and let it dry completely. All the way. 100%. You get the point. 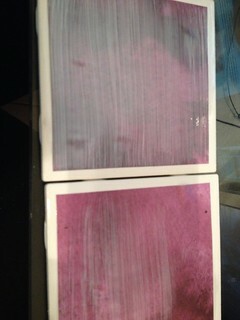 Once the paper has dried to the tile, you want to apply a layer of Mod Podge right over the top of the paper and tile. 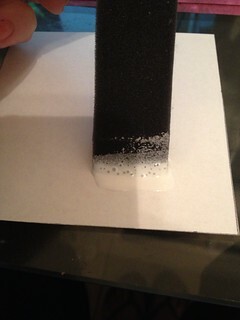 You want to make sure to coat the glue evenly and in thin layers. Don’t worry about going over the edges a little, it is better than not getting all the way to the edge because it will cause a rough texture around the corners. Also, don’t freak out! 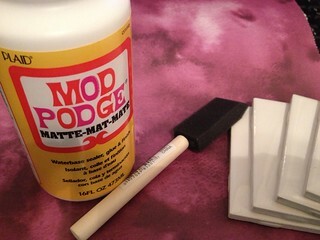 It will look like that Mod Podge is not going to dry completely clear, but it does, you just need to give it time. Repeat this three to four times so your coasters get a nice seal on them. Wrap the coaster in a cute decorative ribbon and give them as a gift, or set them on the coffee table and start using them. You can wash these by hand, but don’t put them in the dishwasher. 1. Add felt feet to the bottom if they will be used on sensitive surfaces like glass. 2. Add an acrylic tile sealant to make them even more waterproof for heavy-duty use. 3. I am excited to try making these with photos instead of scrapbook paper, I just need to go out and take some photos that will look good cropped into squares. Let me know how your coasters turned out in the comments. These were fun, and really easy to make and I look forward to making more sets as gifts for friends and family.